It's the week of Thanksgiving and It's time to give Thanks. However, we should always give thanks not just on Thanksgiving. It's also the week of Black Friday! It's time to get the Christmas shopping kicked in High Gear. I love shopping at Target. They always have great deals. This year on Black Friday they are having 40% off on all sweaters and Shirts. What woman doesn't love a good sweater? I know I sure do. So if you are looking to buy some stylish sweaters for your mom, sister, aunt, cousin, friend or Woman in your life, then look no further than Target. They have the most adorable sweaters and you can't beat 40% off on Black Friday's Deals. 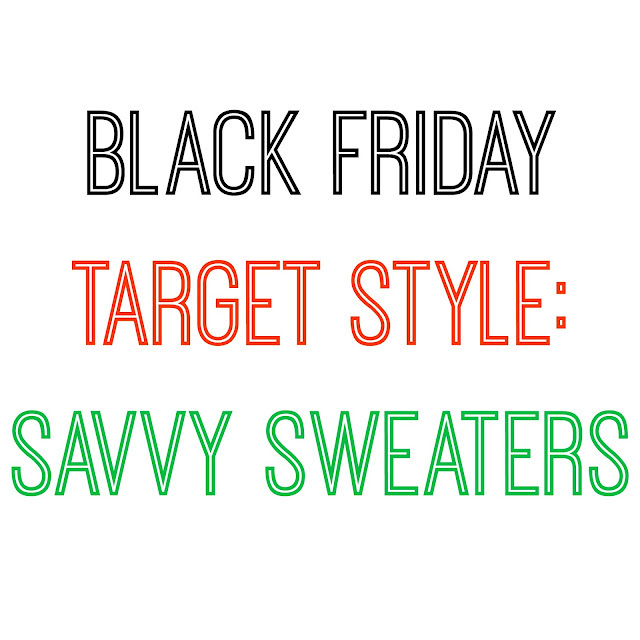 Here is the round-up of my favorite savvy sweaters. Tif @ Bright on a Budget also has a great Black Friday Target Style Guide so don't forget to check it out. To shop just click on the images below. Go ahead and add them to your shopping cart and when Black Friday rolls around, the sales prices will hit and all you have to do is check-out. Notice the Ugly Sweater up top! I just had to add this to my list of favorites. Target has the most adorable Ugly Sweaters that will be perfect for any Ugly Sweater Christmas party. Target sales in store start at 6pm Thanksgiving Evening to get an early start for Black Friday Shoppers. Sales will also be online too. However, I'm not sure what time online sales begin. Don't forget to shop with Ebates. It's a legitimate website that gives you cash back for your purchases from your favorite stores. You even get some just for signing up! They'll even have special cash back deals around Black Friday and throughout the Christmas shopping season.